Maybelline New York presents the stunning V-face Duo Stick by Face Studio that makes it easy to define, shape and highlight your features like a pro. An all-in-one contouring and face sculpting duo stick, this gives dimension to your face with its contouring shade and highlighter. 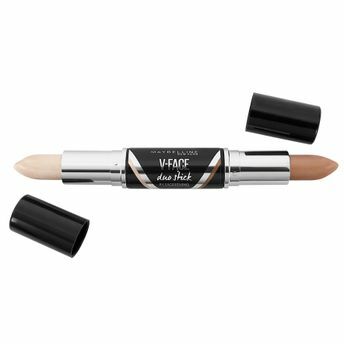 Promising a 10% slimmer face and an instantly sharper nose in just a few steps, Maybelline V-face Duo Stick can be used to accentuate your features with ease to achieve that natural foolproof contoured look! Additional Information : A world renowned cosmetic brand, Maybelline New York is known for its scientifically-advanced makeup formulas, revolutionary textures and up-to-the minute, trendsetting beautiful makeup products that are affordable and make you look effortless and stunning. With Maybelline, it?s all about empowering women to make a statement and explore new looks each day! Explore the entire range of Highlighters available on Nykaa. Shop more Maybelline New York products here.You can browse through the complete world of Maybelline New York Highlighters .Alternatively, you can also find many more products from the Maybelline New York V-Face Duo Stick range.